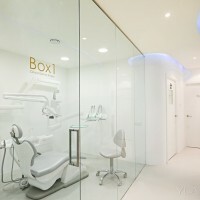 YLAB Arquitectos have designed the interior design and brand image of Dental Angels, a dental office located in Barcelona, Spain. 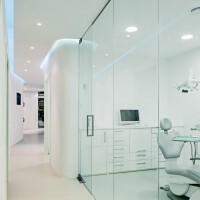 Brand image and interior design project for the dental office Dental Angels in Barcelona’s central Ensanche Neighborhood, in a small and narrow space at street level. 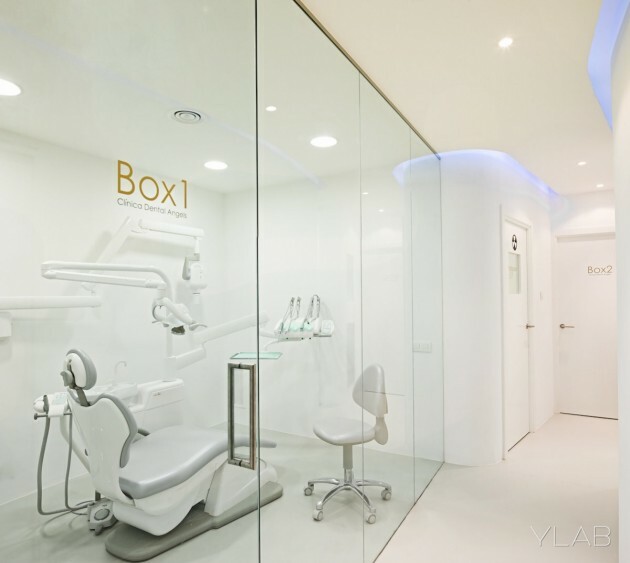 The owner, a young doctor, wanted to create a modern and functional clinic that reflects the charm and pleasantness suggested by its name: Dental Angels. The aims of the project were to achieve a differentiating image, elegant while accessible, professional and fresh. The spaces had to be wide and bright and the ambience warm and comfortable. 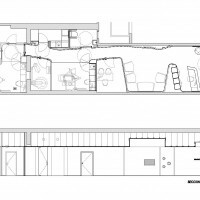 For this purpose, an organic distribution was proposed were all the functions would be placed in a unique continuous space that would suggest dynamism and a spacious feel. White color was chosen as a base color, adding gold and light blue accents by corporative elements like the golden signs, elements like the cylindrical displays or the RGB LED linear indirect light. Timeless materials or finishes like white satin lacquer, laminated panels for the clinical furniture or light linoleum for the pavements are used, combined with surfaces that add lightness and warmth like the gold aluminium or the walnut. 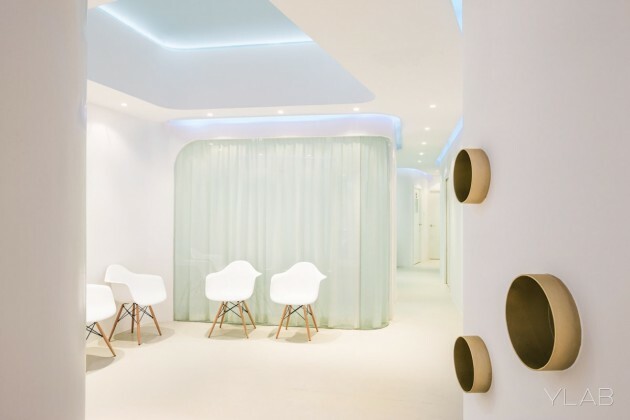 Light colors, curved shapes and the indirect lighting which goes through all the areas, convey the sensation of calm and balance both for patients and medical staff.